One of the major changes in our 2015 test suite is the synthetic Iometer tests we run. In the past we used to test just one or two queue depths, but real world workloads always contain a mix of different queue depths as shown by our Storage Bench traces. To get the full scope in performance, I'm now testing various queue depths starting from one and going all the way to up to 32. I'm not testing every single queue depth, but merely how the throughput scales with the queue depth. I'm using exponential scaling, meaning that the tested queue depths increase in powers of two (i.e. 1, 2, 4, 8...). Read tests are conducted on a full drive because that is the only way to ensure that the results are valid (testing with an empty drive can substantially inflate the results and in reality the data you are reading is always valid rather than full of zeros). Each queue depth is tested for three minutes and there is no idle time between the tests. I'm also reporting two metrics now. For the bar graph, I've taken the average of QD1, QD2 and QD4 data rates, which are the most relevant queue depths for client workloads. This allows for easy and quick comparison between drives. In addition to the bar graph, I'm including a line graph, which shows the performance scaling across all queue depths. To keep the line graphs readable, each drive has its own graph, which can be selected from the drop-down menu. I'm also plotting power for SATA drives and will be doing the same for PCIe drives as soon as I have the system set up properly. Our datalogging multimeter logs power consumption every second, so I report the average for every queue depth to see how the power scales with the queue depth and performance. While the other SSDs hover at 60-90MB/s for random reads, the SM951 provides a rather noticeable upgrade at 108MB/s. 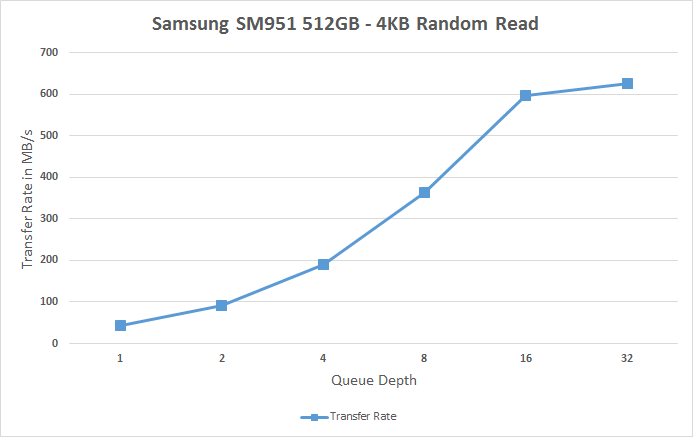 Looking at the performance more closely reveals that the SM951 delivers better performance at all queue depths, although obviously the difference is at high queue depths where the SM951 can take advantage of the faster PCIe interface. The SM951 actually does over 150K IOPS when the MB/s is translated into throughput. 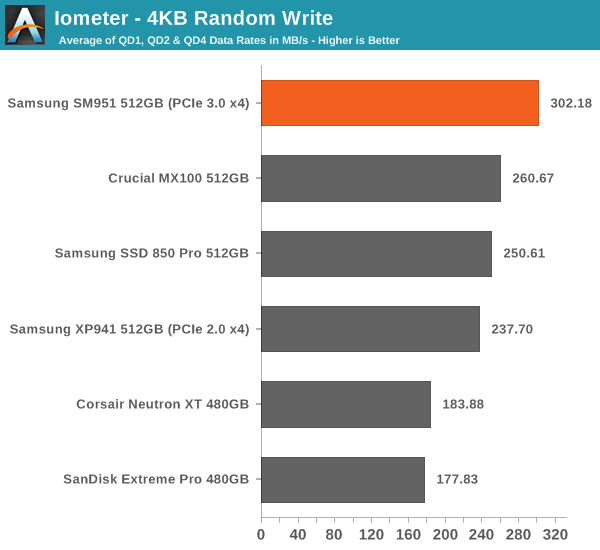 Random write performance is equally strong. 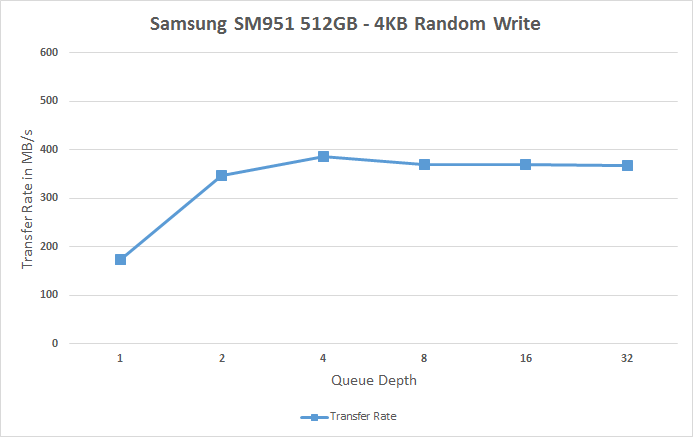 The line graphs shows how the SM951 shifts the whole curve up, implying a performance increase at all queue depths. Especially the performance at queue depths of 1 and 2 are noticeably better than on other drives.